French supermarket giant Carrefour is piloting an LED in-store lighting system in its Lille hypermarket that sends location-based services, offers and promotions to a shopper’s smartphone anywhere across the 7,800 square metre shop floor. For the service, the chain has installed 800 linear LED lighting fixtures, measuring 2.5 kilometres in length, using an intelligent lighting system developed by Philips that makes use of patented Visible Light Communication (VLC) technology. “Philips’ indoor positioning system consists of LED fixtures, a cloud-based location database and a Philips software development kit (SDK) upon which customers can build their mobile interaction platform,” the company explains. As part of the installation, Philips software and cloud-based location database has been integrated into Carrefour’s Promo C’ou mobile app. 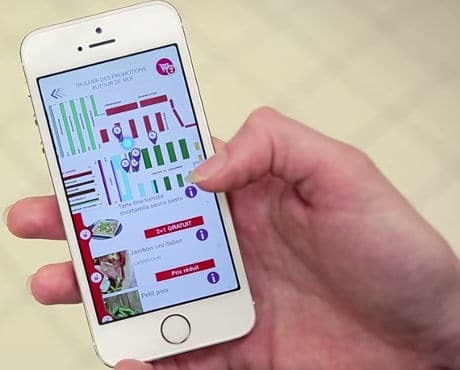 Created by Think&Go, the app is also being used in Paris to allow consumers to prepare a shopping list ahead of their visit and then find their items using geo-tagged NFC shelf edge labels. The app was extended in March to allow shoppers to use their smartwatches in-store to find chosen groceries and receive loyalty points. As well as providing new services to customers, such as helping shoppers to navigate and find promotions, the LED lighting will reduce the store’s total lighting-based electricity consumption by 50%. “We are always on the lookout for innovations to facilitate customers’ navigation in our stores and meet consumers’ expectations,” says Celine Martin, director of commercial models and innovation at Carrefour. Rival GE Lighting has also developed an LED-based communications system and is working with US startup Bytelight on a service that lets merchants use LED lighting installed in and around their stores to send offers, directions to particular products and information services to shoppers based on their precise location within a store.